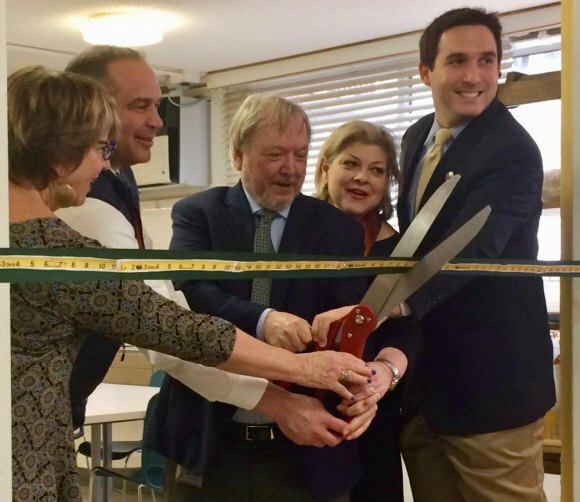 RIOC President Susan Rosenthal and Council Member Ben Kallos help CBN's Bill Dionne and Lisa Fernandez cut a new sewing program ribbon in March. Protest hit my inbox soon after the news was out. "Did you see this?" asked one resident. "Something is really wrong. This has to be adjusted." Easier said than done, but lets see if RIOC blows another one, letting the insular Common Council get away with a feelingless slap in the face to seniors. You might expect some ignorance. The Residents Association Common Council is so disconnected with Roosevelt Island's seniors they couldn't scare up a single candidate to represent 546 Main Street, our traditional seniors building, in their recent election. Blessed with 50% more in public purpose money to distribute among Island nonprofits, the Common Council chose to direct just 2% to programs for the elderly. Yes, that's better than last year when the Council, in partnership with RIOC, didn't spend a dime of public purpose funds on them. Seniors represent roughly 20% of the population here and are arguably our most vulnerable demographic, less able to secure resources in fast-paced, expensive city. But the Common Council, recognizing little responsibility for contributing to their well-being, chose to leave it to outsiders. It was radical good fortune for seniors, in 2016, when the City Department for the Aging, encouraged by Council Member Ben Kallos, asked the Carter Burden Network to rescue the Senior Center. It'd been dragged into the gutter, crippled by thefts and mismanagement for years. So, you might assume disrespect for the elderly was already well established on Roosevelt Island. Nobody here was looking out for them. The City, through DFTA and Ben Kallos, was forced to reach off the Island for a rescue. That was two and half years ago. Since, the full extent of senior abuse at the Center has been widely publicized as has its rescue. Community leaders had plenty of time to fix their skewed focus. They failed. So did RIOC. CBN scrambled, pulling a top manager, Lisa Fernandez, out of another center and persuading highly respected and energetic Hallie Shapiro to join the effort. Executive Director Bill Dionne sent his best to Roosevelt Island, determined to make it work. From the days of its eponymous founder, Carter Burden laser focused on seniors. It never mattered where they lived. Carter Burden's widow, decades later, still serves on the board, assuring his commitment is carried out. Fernandez got all of 30 days of training with a team from DFTA, then she and Shapiro devoted all they had to saving the Senior Center, buffeted by headwinds from locals who instinctively turn an unwelcoming back on "outsiders," no matter who they are or what they're trying to do. Yet, it was elderly Islanders who'd suffered neglect and now started getting the care and concern due them. From "outsiders." It was a lesson from which the Common Council and RIOC could learn. They didn't. More important, ask the seniors flocking to the Center in greater numbers than ever before, for lunches, for exercise and health programs, for art, advice on taxes and estate planning, and for the simplest of pleasures, passing the time with their contemporaries. The Roosevelt Island Senior Center was reborn under the Carter Burden Network. Everyone who cares to take the time knows this. Seniors are thriving. It's not a debatable point. Walk through the Center, any time, Monday mornings or Friday afternoons. You find seniors using computers on which they've been trained for free. You find friends chatting in a lounge made comfortable through a generous donation from Cornell Tech, a place to escape the isolation that's the bane of many senior living situations. Now, it seems, CBN is about to be penalized for its success by RIOC and the Common Council, and by virtue of that, so are Roosevelt Island's seniors. A year ago, CBN's Executive Director chose not to ask for public purpose funds. Bill Dionne wanted time to show the community that CBN is not a self-serving operation but one that contributes resources to benefit seniors. In this case, Roosevelt Island Seniors. His organization brought in new programs, including a sewing room for classes sponsored by the Ravenswood Power Plant, Feldenkrais Exercises, Mindfulness Meditation, free medical assistance from Hunter College nursing students... The list goes on. Roosevelt Island seniors also got a 50% increase in professional staffing and many times that in decency and consideration from the Carter Burden Network. The Common Council was not impressed. Neither apparently was RIOC. Both seem willing to leave it to the outsiders when it comes to taking care of our seniors. CBN brought all its information about increased senior services, without assistance from PPF money, to Good Shepherd Community Center, in its presentation before the PPF committee. Was there something more to it? Some behind the scenes politicking aimed at undermining the "outsiders...?" When it came time to recommend public purpose fund grants, the Common Council savagely reduced CBN's request for funds to increase programs for seniors by 85%. Were they taking lessons from Republicans out to kill the safety net? No other group got slashed like that. No other group, whatever their mission, got less than 3X the amount recommended for seniors. Out of $150,000, the Common Council voted only $3,250 for seniors. I'm not questioning the value of the other nonprofits competing for funds. All are worthy. All serve important aspects of our community. But why so much of an already insufficient pie for everyone else and next to nothing for seniors? It seems the Common Council and, by extension, RIOC absolved themselves of responsibility for contributing to the welfare of our seniors. A tradition or poor judgment, myopia and selfishness continues under new management. But the simplest truth is that all nonprofits are equally poor, no matter where they are. All their money goes to programs. Any perceived prosperity comes from what they do for their beneficiaries, a reflection of an organization's success at doing its job. And it's not about the organizations anyway, is it? It's about the people served. Main Street Theatre & Dance Alliance serves a public performance, mostly young target group. Wildlife Freedom Foundation helps stranded animals. Island Kids serves children and their parents with creative programs busy families would otherwise go without. Aren't those the things Public Purpose Funds, by definition, are intended for, not the organizations independent of their stated missions? The Common Council and its PPF committee gave our seniors a cold slap in the face, rejecting funding intended for them. It matters little whether the funds are administered by Humpty Dumpty, the Wizard of Oz or Carter Burden. When you push back against an organization that's done more than any others here to improve the welfare of our vulnerable elderly, you hurt seniors and you damage your community's reputation. It appears the hoped for change that would make the Common Council less provincial and self-centered is farther off than we hoped. But there's one last ray of hope. The indifferent Common Council passed along to RIOC recommendations. They are not binding. The Board has a chance to do the right thing and override this outrageous insult to seniors.